The woman was arrested a year ago after giving a speech in Bangkok in which she attacked the monarchy. The start of her trial was delayed this week when her lawyer appealed against the decision to hold a closed trial. Critics say strict laws against insulting the monarchy are being used to stifle discussion of its future. Thailand concedes that the lese-majeste laws are imperfect, but says they protect the monarchy. People in Thailand who have listened to the speech say they have never heard anything like it. Daranee Charncherngsilpakul took to the stage at a protest in central Bangkok in June last year and sharply criticised the monarchy. 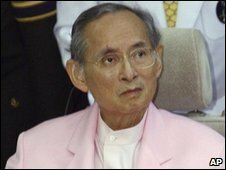 She even made personal attacks on the country's revered King Bhumipol Adulyadej, warning him that the monarchy would be overthrown by a popular revolution. Going by the nickname Dar Torpedo, she was already well known as an outspoken supporter of ousted Prime Minister Thaksin Shinawatra. But the blunt language she used to criticise the King in a public arena, just a short distance from the palace, has shocked even those Thais who do not consider themselves ardent royalists. The presiding judge ordered hearings to be held in secret, citing national security concerns. Her lawyer is appealing, on the grounds that Thailand's constitution guarantees defendants the right to a public trial. Sam Zarifi from Amnesty International has warned that "when a judge closes the doors on a trial it significantly raises the risk of injustice taking place. "The Thai government will have a very difficult time explaining why the trial of someone charged with making an insulting remark could compromise Thailand's national security," he said. Until recently the lese majeste law was rarely invoked in Thailand - but the number of cases has risen sharply during the political turmoil of the past three years. A colleague of Daranee Charncherngsilpakul was jailed for six years last November. Earlier this year a 34-year-old engineer was jailed for 10 years for posting a video deemed insulting to the monarchy on the website YouTube. Neither trial was mentioned in the mainstream Thai media. In January this year an Australian man, Harry Nicolaides, was also jailed for three years over a novel he wrote four years ago in which he referred briefly to the scandalous private life of a Thai crown prince. He was later pardoned. Police say they are now preparing to arrest several more anti-government activists on the same charge. 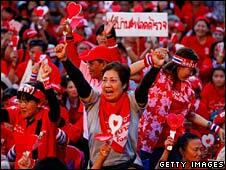 The pro-Thaksin red shirt movement is known to have a number of republican sympathisers and former communists in its ranks. Mr Thaksin himself has been accused by his critics of harbouring plans to abolish the monarchy, accusations he has strongly denied. The government has acknowledged that the lese majeste law has flaws - but says it is necessary to protect the monarchy. Critics of the law argue that it is being used to stifle discussion of the monarchy's future, at a time of heightened public anxiety over the succession, because of the King's age and frail health.